We simply have been building fiberglass pools much longer than any of our competitors. Our pools and equipment are simply the finest made. 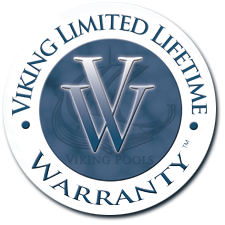 We have selected Viking Pools because of their unique features and unsurpassed quality, including their unique ceramic core construction for unsurpassed strength, durability and their dazzling crystite finishes. These features make Viking's pools the strongest and most aesthetically pleasing fiberglass pools. Sprinkle in Aqua Pools' unsurpassed pride in quality and craftsmanship and you have a pool extravaganza that's hard to beat. Our pricing is always competitive and we do not compromise real quality to achieve minor cost savings. The combining of premium raw materials and our unique four stage manufacturing process creates a Viking pool of unequaled look and performance. Whether it's the natural beauty of Crystite or the standard gel coat, Viking pool finishes have an incredible lifetime structural warranty and a limited lifetime surface warranty. 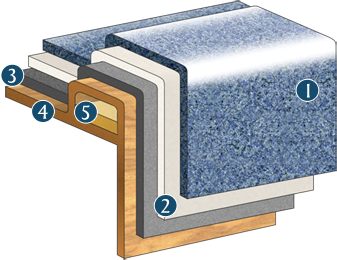 Closed Beam Coping: Means your pool is built using the strongest method of construction in the industry.